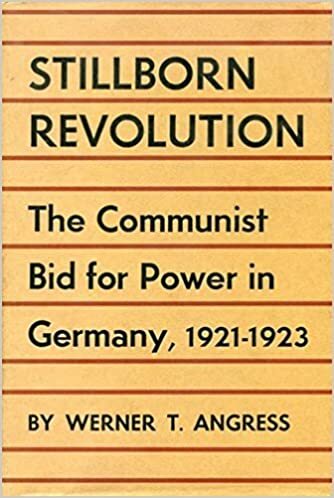 This is the third chapter from Werner Angress’s “Stillborn Revolution: The Communist Bid for Power in Germany, 1921-1923” that deals with the March 1921 Aktion that was an ultraleft adventure sanctioned by the Comintern. When it turned out to be a disaster, Paul Levi, who had already been ousted from party leadership, wrote a blistering and public critique titled “Our Path: Against Putschism” without bothering to get the whacked-out CP leadership’s approval. This got him expelled from the CP even though Lenin plagiarized his analysis and defended it at the Third Congress Of The Communist International that met in Moscow between June 22-July 12, 1921. Unlike Pierre Broué, whose history of the German CP in the 1920s shares the same criticisms, Angress sees the Third Congress as the first step in the Comintern’s assumption of a centralizing dynamic that prefigures Stalin’s totalitarian control. Even if Lenin and Trotsky had the authority to read the German ultraleft the riot act and set the CP’s on a more rational course, that authority served to rob the CP’s of the independence they once enjoyed. Specifically, in the case of Germany, it meant undermining the Rosa Luxemburg’s conception of how a revolutionary party should function that was defended by Paul Levi, her successor. In my next series of excerpts, I will be dealing with another fiasco imposed on the German CP by the Comintern that led to the Fourth Congress’s “Bolshevization” turn, which in turn led to the sect formations the left has been trying with mixed results to supersede in the past 30 years or so. THE BATTLE was over, the party counted its losses, and victors proceeded to punish the vanquished. Public opinion was bitterly hostile to the Communists, particularly because, during the last stages of the uprising, the fighting in Prussian Saxony been ferocious, and charges of atrocities were raised by both sides. On March 29 the Prussian government established special courts for the prosecution of captured agitators, and for weeks after the end of hostilities the legal mills ground out sentences which altogether amounted to an estimated 3000 years of prison and penitentiary terms for 4000 insurgents. Five years earlier, when the British under somewhat similar circumstances crushed another Easter rebellion, that of the Sinn Feiners, they executed Sir Roger Casement and fifteen other leaders, but showed marked restraint in dealing with the rank and file of the Irish Volunteers and the Citizen Army. In Germany, on the other hand, only two prominent leaders, Max Hoelz and Heinrich Brandler, were tried and convicted, whereas on the rank and file, who had borne the brunt of the fighting, fell most of the retribution that followed. It was therefore hardly surprising that the membership of the Communist Party, which at the beginning of the uprising had numbered about 350,000, dropped to a mere 180,443 by the summer of 1921. As soon as the insurrection had collapsed, the Communist Party underwent a grave internal crisis, set off by Paul Levi. News of the Aktion had reached him in Vienna, on his way to Italy, and he returned at once to Germany. As he was no longer a leading official, Levi had to gather his information from friends and acquaintances who had participated in the various decisive conferences held by the party prior to and during the initial stages of the uprising. On March 29 he sent a summary of his findings to Lenin in a confidential letter in which he made it quite clear that he felt in no way responsible for what had occurred, but that he would not interfere while the uprising was in progress. The first Central Committee meeting after the debacle was held on April 7 and 8. The new leadership failed to invite Levi, presumably because they did not care to have him state his views on their conduct of the party’s affairs. But they could not very well exclude Clara Zetkin, then in her sixties. After Brandler had given his version of the recent developments, the old lady proceeded to castigate the Zentrale for having recklessly precipitated an Aktion. She criticized the use of extreme and unrealistic political slogans which, she said, had turned the masses against the KPD. She called for an end to “revolutionary calisthenics” and for a return of concern for the interests of the masses; she concluded her speech with a motion for a vote of censure of the Zentrale’s policy and asked for a special party congress (ausserordentlicher Parteitag) in the near future to air all problems in open debate. After a brief discussion, Clara Zetkin’s motion was put to the vote and defeated 43 to 6, with three abstentions. Encouraged by this initial victory, the Zentrale introduced a resolution of its own which turned into a lengthy and involved justification of the revolutionary offensive, presenting it as the only proper revolutionary approach in the face of counterrevolutionary provocation and assault: “The overall situation . . . required . . .the sharpest class struggles; it demanded that the working class seize the revolutionary initiative . . . resolve upon independent action, and meet the counterrevolution in a powerful counterattack. . . .” In answer to Zetkin’s criticism that faulty tactics had alienated the masses, the Zentrale produced the excuse that the German workers had remained passive as a result of unemployment and Socialist demagogy. Under the circumstances the KPD could not afford lo wait until the reluctant workers took courage, and the party chose to risk defeat rather than to do nothing. The resolution, meandering on through twelve paragraphs, praised the fighting spirit displayed by the party, re-emphasized that revolution was the ultimate duty of every Communist, and consigned responsibility for defeat to the counterrevolutionaries and their Socialist lackeys. It concluded with the same tone of self-righteousness with which it began: “Therefore the Central Committee approves of the political and tactical attitude taken by the Zentrale; condemns in the strongest terms the passive and active opposition of individual comrades during the Aktion; and calls upon the Zentrale to put the organization into top fighting condition by introducing all measures required to do so. The resolution was voted upon and passed 26 to 14. A number of additional motions, dealing primarily with organizational improvements, enforcement of discipline, and the right of the Zentrale to expel any individual who was found unworthy of remaining a party member, passed equally handsomely and enhanced the triumph of the Zentrale. One of its members, Max Sievers, was deprived of hit office because he had broken party discipline during the uprising, and the Central Committee adjourned. The failure of Clara Zetkin’s criticism prompted Paul Levi to address himself directly to the public. As soon as he was informed of the outcome of the Central Committee meeting, he sent to press a polemical pamphlet on the Aktion which he had written a few days earlier, April 3 and 4. Unser Weg was a blistering attack on the methods and errors of the Zentrale, interspersed with several oblique references to Kun and his colleagues. Levi wrote the pamphlet with a lawyer’s touch and the pathos of a thwarted lover. He had been forced to watch the party, which he had helped to found, fall into the hands of incompetents, adventurers, and misguided idealists who, within the short span of a week, had almost succeeded in thoroughly discrediting the Communist cause. All the bitterness, the disappointment, the indignation of the author were reflected in the sharp and aggressive tone of the pamphlet. Levi revealed, sometimes openly, sometimes by insinuation, that the initial plan for an uprising did not originate within the KPD; that the theory of the revolutionary offensive dominated the thinking of party leaders, thus belying the insistent use of the word “defensive”; and that provocations were employed as a means of creating mass action. At the Central Committee meeting on March 16, Frolich had said that the proposed course of action was “a complete break with the past.” Levi commented sarcastically: “It is indeed an innovation in the history of the party which Rosa Luxemburg has founded; it is a complete break with the past that the Communists should labor like juvenile male prostitutes [Achtgroschenjungen] to provoke the murder of their brothers.” But Levi reserved the highest pitch of his angry eloquence for the manner in which the Zentrale had ordered the rank and file into battle, while the leaders themselves stayed in Berlin. “The Zentrale accelerated the action [steigerte die Aktion]. Squad upon squad rose. . . . Heroic and disdainful of death, the comrades got ready. . . . Squad upon squad prepared for the assault—as the Zentrale ordered. Squad upon squad moved up into battle—as the Zentrale ordered. Squad upon squad met with death—as the Zentrale ordered. [Fahnlein urn Fahnlein ging in den Tod—wie es die Zen-trale gebot.] Ave morituri to salutant“. This passage contained the gist of Levi’s argument: the Zentrale, acting with criminal irresponsibility, had needlessly caused the death of many of its followers. Levi demanded that the guilty ones resign from the leadership of the party.” The pamphlet was published on April 12 and caused a sensation in party circles. The Zentrale was outraged, not only because former chairman washed the party’s dirty linen in public, but also because he revealed secrets which most Communist leaders were not eager to see in print. The only ray of light was the receipt of a congratulatory message from the Communist International, dated April 6, 1921, which was printed in the Rote Fahne immediately after the appearance of Levi’s accusations. Its closing words lead: “The Communist International says to you: You acted rightly! The working class can never win victory by a single blow. You have turned a new page in the history of the German working class, prepare for new struggles. Study the lessons of your past struggles Learn from your experience. Close your ranks, strengthen your organization, legal and illegal, strengthen proletarian discipline and Communist unity in struggle . . . .
Long live the Communist proletariat of Germany! Long live the proletarian revolution in Germany! Encouraged by the emphatic slap on the back, the Zentrale prepared to deal with Levi, whose expose made him liable to disciplinary action. But Levi did not stand alone. Many of his friends. some still in leading positions, shared his views. One of them, a former leader of the Revolutionary Shop Stewards, Richard Muller, had gone at the height of the uprising from one Berlin factory to the next in order to dissuade the metal workers from supporting the general strike. Others, too, had made no secret of their disapproval, In short, the Zentrale knew that the party faced a crisis. But most of its members, irritated by the defeat and stung to the quick by Levi’s public exposure of their actions, were eager to turn on the rebel and his supporters. On April 15, 1921, he was formally expelled from the party on the grounds that he had violated party discipline and solidarity. Upon being asked to surrender his Reichstag seat, Levi refused and appealed to the Central Committee for a hearing. Levi’s expulsion had immediate repercussions. Eight prominent Communists sided with him by affirming their solidarity with his aims and endorsing his charges against the Zentrale. Four of the frondeurs, Clara Zetkin, Adolf Hoffmann, Ernst Daumig, and Otto Brass, were former members of the Zentrale; one, Curt Geyer, was a member of the Brandler Zentrale, and the remaining three, Heinrich Malzahn, Paul Neumann, and Eckert, were members of the party’s ReichsgewerkschaftsZentrale, a subdivision of the Zentrale in charge of union affairs. Yet the majority of the Communist leaders remained unimpressed. Neither Levi’s criticism nor the demonstrative attitude of his supporters could shake their conviction that they had done the right thing. By way of emphasis they put themselves on record when in mid-April they published a defense of the March uprising under the title Taktik and Organisation der Revolutionaren Offensive: Die Lehren der Marz Aktion. The Central Committee held another meeting from May 3 to 5, and on May 4 invited Levi to appeal his expulsion. Since Brandler had been arrested by the police on April 18, Wilhelm Pieck presided as acting chairman. It had been Pieck’s intention to restrict the discussion of the “Case Levi” to the question of whether or not Levi had committed a breach of party discipline. To the chairman’s chagrin, Levi shifted the issue by asking whether the March uprising was justifiable or not. He answered this question in the negative and proceeded to repeat the charges which he had made earlier in his pamphlet Unser Weg. Taking issue with such terms as “offensive,” “defensive,” “transition from agitation to action,” all of which were being bandied about indiscriminately by the Zentrale, Levi pointed out that the use of these terms amounted to hairsplitting because throughout the uprising the party leadership had exhibited an offensive spirit. Only necessity had eventually transformed the Aktion into a defensive struggle. Furthermore, the party’s policy during those fatal March days had been full of irresponsible decisions, faulty judgments, inadequate preparation, and poor organization. Terrorist measures—the responsibility for which Levi ascribed, by implication, to Kun—and ill-conceived strategy had ruined the party’s hold on a district which had been one of the foremost Com. munist strongholds in Germany. In addition, the Zentrale had given no thought to public opinion and had grossly overestimated the in. fluence and strength of the KPD. If Levi had any illusions that he could achieve a reversal of the original decision to expel him, he was disappointed. The Central Committee was unimpressed by his eloquence. Reuter-Friesland voiced his regret that Levi’s expulsion was to be based solely on his breach of discipline. Presumably he was more concerned with the heresy of Levi’s behavior, a sentiment quite in line with the fiery defense of the Aktion which Reuter-Friesland had offered at a meeting of Berlin’s KPD leaders a few days earlier. At that meeting, Levi had watched with dismay the enthusiastic reaction of the audience and had commented resignedly with a pun on a line from Schiller’s Wallenstein, “It must be night where Friesland’s [Friedland’s] stars are shining!” The night did not lift at the meeting of the Central Committee which, by a roll call vote, upheld Levi’s expulsion 36 to 7. With the “Case Levi” apparently closed, the Central Committee got ready to deal with Levi’s supporters. On April 20 the Zentrale had notified the eight principal “Levites” that those of them holding Communist seats in the Reichstag must surrender them to the party at once. Following Levi’s example, they refused, and they persisted in their refusal when the Central Committee reiterated the order on May 4. Faced with what amounted to open rebellion, the committee resorted to a half-measure by passing a vote of censure (31 to 8) against the recalcitrant group, probably in the expectation that the matter would be taken up anyway at the Third Congress of the Communist International which was scheduled to meet in June. There remained one piece of business, a reshuffling of the Zentrale. Max Sievers had been already expelled from his post. Now Paul Wegmann and Curt Geyer joined his fate. The three openings were filled by Jakob Walcher, Emil Hollein and Hugo Eberlein, all old party hands who could be trusted to support the present Zentrale. The first leader purge conducted by the German Communist Party war over. A renowned party member, a protege of Rosa Luxemburg, and a man who for a crucial year had occupied the highest office the KPD could bestow, had been driven from the party in disgrace. In addition, eight of Levi’s supporters faced the prospect of sharing his fate before long. It would be wrong to assume, however, that the “Right Opposition,” as the group came to be called at the Comintern Congress, had rejected Communism. Levi and his friends were still loyal adherents to the cause, and some of them, notably Clara Zetkin, remained so to their death. They were up in arms because they felt that the new Zentrale had abandoned the course which Rosa Luxemburg had laid down for the party. The Zentrale, with the full support of the left wing, indignantly denied this charge. Neither faction perceived that the fundamental issue was not whether the Levites or the Brandlerites had followed the right course, but to what extent both had failed, and what consequences this would have for the future. None of them, in fact, real-ized that the KPD had arrived at a major crossroad. The split within the party remained unresolved during the preparations for the Third Comintern Congress. The official delegation of the KPD, all firm champions of the March action, was led by Thalheimer and Frolich. Together with the Communist youth group, it numbered thirty-three delegates. Clara Zetkin, virtually constituting a delegation of her own, went as representative of the Communist Women’s League and also acted as the unofficial spokesman of the Right Opposition. In addition, and by special request from Lenin, Heinrich Malzahn and Paul Neumann attended the congress to state the views of the opposition. As they had not received a mandate from the Zentrale to speak for the party, they had only an advisory vote, and attended to all intents and purposes as a disenfranchised grievance committee. Finally, the KAPD sent four delegates, which put the Germans, divided though they were, among themselves, in second place as far as numerical strength at the congress was concerned. But they, and everyone else, were dwarfed by the Russian delegation of seventy-four voting members. The German delegation left for Moscow with the expectation that the Russian leaders would receive them as heroes, especially after the ECCI, on April 29, had endorsed Paul Levi’s expulsion from the party in a letter bristling with expressions of disgust and contempt for “the traitor.” They were to be disappointed. The Russians had in the meantime “reinterpreted” the March uprising. The process had been accompanied by severe factional struggles, because the debate on the uprising was only part of a more fundamental problem, the future of world revolution. Ever since the Russo-Polish War of 1920, the revolutionary wave in Europe had subsided, a development which Lenin, at least, was unwilling to ignore. During the winter of 1920-1921, when general unrest all over Russia culminated in the Kronstadt mutiny and made it abundantly clear that the Bolshevik government could strengthen its hold on the people only by giving the country a chance to recover from the civil war, Lenin decided to buy time by making concessions at home and abroad. The first of these was the introduction of the New Economic Policy, which included vigorous efforts to improve trade relations with Western capitalist countries. The German March uprising was thus completely out of tune with the trend that was developing in the fatherland of the revolution. On March 16, the day that Hörsing’s appeal was published, and the German Central Committee listened to Brandler’s variations on a theme by Kun, Russia signed a trade agreement with Great Britain. The Kronstadt mutiny was crushed on March 17, and Lenin had officially introduced N.E.P. on March 15. No wonder that Lenin was unenthusiastic about the German events, that he was hardly surprised when the uprising failed, and that he profoundly disapproved of the whole adventure. Since the KPD was the strongest Communist party outside Russia, its fortunes and misfortunes served as a useful gauge to assess the chances for further revolutions in Europe. The recent fiasco, therefore, confirmed Lenin’s view that a temporary retreat on the revolutionary front was necessary, and he wanted to impress this view on the congress by making the German debacle a starting point for a change in over-all Comintern strategy. In order to be effective, Lenin had to secure prior unanimity among the Russian leaders, which was not easy. Trotsky and Kamenev sided with Lenin in condemning the German putsch, but Zinoviev, Bukharin, and Radek defended it. We do not know the details of these factional struggles which preceded the opening of the congress; nor do we know whether a personal report by Clara Zetkin to Lenin was made before or after the Russians had settled the matter. It is very likely, however, that Zetkin’s detailed description of what had occurred in Germany strengthened Lenin’s determination to disavow the Kun-Brandler-Thalheimer-Frolich theory of the revolutionary offensive, especially after Zetkin’s report was confirmed and elaborated by Neumann, who were likewise questioned by Lenin. Whatever the exact sequence of events may have been, by the time the congress was about to convene the Russians presented a united front on the German question. The Lenin-Trotsky faction overruled Zinoviev and Bukharin after Radek, always a flexible man, abandoned the latter, an action which netted him their angry abuse. News of the latest official Russian position came as a shock to the German delegates. After the initial congratulatory message from the ECCI they had counted on full Comintern endorsement of their policy. Now, on the eve of the congress, they were informed that they had blundered, and that they must under no circumstances embark on a similar unprepared venture in the future. Although the Russians upheld the German party in the matter of Levi’s expulsion, Lenin let it be known that he basically agreed with Levi’s criticisms and only objected to the methods which the former party chairman had employed in making them. By the time the proceedings began, Lenin and Trotsky were assured of the unconditional, though not entirely enthusiastic, support of their Russian colleagues. They had whipped the ECCI into line and had duly warned the German delegation to prepare for some rough treatment. With these preliminaries out of the way, they could entrust the issue to the congress, confident that their views would prevail. And so they did. Despite occasional fierce verbal duels, indignant interjections, and angry charges and countercharges, an air of unreality pervaded the debates whenever the March uprising was on the agenda. The Russians had set the stage very well. Any direct references to such precarious subjects as the role of the ECCI, especially as far as the Kun mission and Zinoviev’s share in it were concerned, and the Zentrale’s attempts to create a revolutionary spirit artificially, were excluded from open debate. These topical taboos benefited the ECCI and the Bolshevik leadership, and restricted both German factions in their arguments. The critics of the uprising had to couch their charges in carefully worded insinuations, and the proponents of the revolutionary offensive could not invoke Kun, Zinoviev, or any other member of the Executive Committee in their defense. Nor does it seem a coincidence that on the Russian side the principal speakers were Radek and Trotsky rather than Zinoviev, who would have been the logical person to place the “German question” before the congress, since he was chairman of the ECCI. Zinoviev had evidently been too deeply implicated in the German imbroglio, and was moreover too reluctant a convert to the official Russian position to serve as its most suitable spokesman. His references to this explosive topic in his official report on the activities of the Executive Committee were accordingly brief and rather innocuous. He complimented the German party for having fought bravely in a struggle imposed from the outside, but when he touched upon the crucial problem of the revolutionary offensive, he skillfully spouted commonplaces with great oratorical emphasis while dodging the issue. The resolution, including its Article II, was scheduled for a vote of adoption at the end of the discussion period. In spite of its deceptive vagueness its significance could hardly be missed. Its wording clearly expressed the right of the ECCI, retroactively as well as for the future, to interfere in the affairs of a member party. In this particular instance, the interference to be sanctioned by the congress referred to the approval by the ECCI of Paul Levi’s expulsion from the KPD. In this respect, therefore, it appeared to be intended primarily as a chastisement of the so-called Right Opposition, but at the same time the phrasing provided sufficient leeway to allow for its application to any other faction. That the resolution made no mention at all of any possible connection between the March uprising and Comintern was hardly surprising. Zetkin’s attack on the errors of the Zentrale were met by a no less fiery counterattack from Ernst Reuter-Friesland. The man who only six months later was to share Paul Levi’s fate now directed all his indignation against Levi and his supporters, notably against Clara Zetkin whom he accused of intellectual dishonesty. While admitting that the March uprising had suffered from mistakes committed by the party leadership, he made it clear that “we shall talk about these mistakes only with those comrades who fought alongside us, and not with those who systematically sabotaged the Aktion.” After a lengthy diatribe against Levi, whom he accused of having persistently undermined the reputation and influence of the ECCI ever since the Second Comintern Congress, Friesland invited Levi’s followers at the congress to take an unequivocal stand condemning him, or forfeit the right to call themselves Communists and members of the Communist International. Shortly before the vote on the “Resolution on the Report of the Executive,” Malzahn and Neumann, the two right-wing opposition delegates who had only an advisory vote, requested that a final vote on the resolution be postponed until after the full-fledged debate on the uprising. They argued that only at the conclusion of this debate could the members of the congress properly judge whether or not Levi ought to be definitely excluded from the Communist movement. Radek employed all the biting sarcasm for which he was famous to discredit the two hapless Levites, badgering them mercilessly. When he had finished, Malzahn and Neumann asked the congress once again, this time formally, to postpone voting on the resolution until after the discussion on the March uprising. Their plea was read aloud and then ignored. Five minutes later the “Resolution on the Report of the Executive Committee of the Communist International” was adopted. The only delegation which abstained from voting on Article II was that of Yugoslavia. No one voted against, but Clara Zetkin stated publicly that the “Case Levi” had been settled “over our protest.” It was a clear-cut victory for the ECCI, though not for the Brandlerites, as they were soon to find out. The vital debate on tactics was introduced by a lengthy speech by Radek, who was the first member of the ECCI to criticize the mistakes of the Zentrale publicly and in detail. But the part of his speech that dealt with the German party lacked force and conviction; his heart apparently was not in it. His introductory remarks amounted to a virtual apology to those whose mistakes he was about to discuss, and one wonders whether this unusual civility was not partly due to the realization that his own role in the March event had not been free of ambiguity. Radek’s criticism of the March uprising included most of the major points later to be incorporated in the official theses of the congress, e.g., the need for capturing the masses prior to any revolution; the need for better party organization and discipline; and the dogma that the uprising had been a defensive action which us spirit of its failure constituted “one step forward.” He carefully concealed how many arguments he had borrowed from the opposition. Moreover, he did not mention that without the constant pressure for “greater activity” which the Executive had applied to the German party, and which culminated in the Kun mission, many of the “errors” would never have been committed in the first place. He was not challenged on these omissions, due to the “oratorical taboos” so prudently devised by the ECCI. Although Radek’s arguments were couched in the deceptively optimistic phrases so peculiar to Marxist rhetoric, the underlying call for a strategic retreat on the revolutionary front was unmistakable. Even when read today, his sophistries sound hollow and they must have impressed his listeners in that way on the afternoon of June 30, 1921. With capitalism inevitably on the decline, he argued, Communism is moving forward to great struggles. However, the decline of capitalism does not proceed in a straight line; nor does revolution, which. has its ebb and flow. If Communists want to fight and win, they must prepare for the struggle—which does not mean that preparation and propaganda should become a substitute for action. But action lies still in the future, and in the meantime the Communists must be the bell which calls the living to battle. The watchword of universal Communism must be, “first and foremost, to the masses, with all means.” The Communists must actively prepare the masses for the eventual struggle by means of propaganda and agitation. Radek’s report heralded a decisive swing to the right, but, as was to be expected, this projected shift of policy was promptly challenged from the left. On the following day a speaker of the KAPD, Hempel, agreed with Radek on only one point, the impending decline of capitalism. The rest of the report he rejected, with all its implications, defending in particular the justification of the revolutionary offensive and partial actions (Teilaktionen), which must precede the all-out revolution. Since the KAPD was not affiliated with the Comintern and its delegates attended merely as guests, this first assault could be ignored by the ECCI. It was a more serious matter, however, when Ernst Reuter-Friesland requested in the name of the German delegation that the next speaker, Comrade Terracini from the Italian Communist Party, be granted a longer speaking time than was customary to justify a number of suggested amendments to the theses developed by Radek. He added that these amendments had been drafted by the German, Italian, and Austrian delegations, and that additional delegations would most probably endorse them at a later time. The request was granted. Terracini, like the KAPD speaker before him, criticized Radck’s report from a radical point of view. He took issue with the condemnation of the theory of the offensive and charged that Radek’s critics were too pronouncedly directed against the radical left wing of the Comintern and its affiliates. As he was probably unaware of the hectic behind-the-scene struggles among the Bolsheviks which had preceded the congress, Terracini said naïvely, “Comrade Zinovicv has spoken at length in his Report on the Executive against rightist tendencies. If we now suggest amendments to the theses on tactics, we herewith merely endorse once again the arguments of Comrade Zinoviev. We do not think that Comrade Radek will raise object ion4 to our amendments.” It was not Radek who raised objections, but Lenin. In a brief speech, delivered in a mildly ironic vein which barely concealed the underlying intensity of his arguments, Lenin tore into the leftist s by ridiculing their charges and amendments. He stated bluntly that all future feuds against the so-called “centrists” within the various Communist parties would have to cease, as the real centrists (Inclining Levi) had been expelled. Violations of this injunction would be fought ruthlessly by the Comintern. He reiterated the necessity to win the masses prior to any future Communist revolution, and defended those passages in the draft which bore on this question and which had become subject to a leftist amendment. It was under the shadow of Trotsky’s essentially pessimist evaluation that the debates on the March action took place. The left-wingers at the congress, and not only the Germans, proved unwilling to accept his perspectives at face value. Most of them not see, or did not want to see, that the debate on the uprising essentially served as a rallying point for two opposing schools of thought concerned with the most fundamental issue confronting the Congress, namely what course the Communist movement was to take in the days ahead. Trotsky alluded to this point when he again addressed the congress, prior to Radek’s summary, to wind up the debate on the German question. After a few brief and condescending remarks directed at Thalmann, who had been the last of the enrages to defend the leftist position, Trotsky turned his attention to the essence of the March action. Many delegates, he said, had complained to him that the German delegation took up so much of the congress’ time in discussing its internal affairs. Such an impatient attitude on the part of these critics was unwarranted. The March action was the main issue under discussion. The congress had to choose between two tendencies. One was represented by Lenin, Zinoviev, Radek, and himself. The other tendency was expressed by the various amendments to the theses on tactics that were soon to be submitted for a vote. “The undersigned delegations, Poland, Germany, Youth International, Hungary (majority), ‘Deutschbohmen,’ and Austria declare that they will accept, in principle, the tactical theses suggested by the Russian delegation, but that they make express reservations concerning the interpretation which Trotsky has given to the theses in his speech.” Thalheimer and Kun were among the signers. The congress then voted to send the draft of the theses to the committee. The great debate on the March uprising was over. While the congress moved to less controversial issues, such as the trade-union question, the economic question, the women question, etc., the committee which worked on the definitive version of the theses on tactics made every effort to eliminate all remaining differences between the two German factions, in order to secure unanimity in the final vote. The Russian leaders were clearly worried by the possibility of a further split within the KPD. During the debate on tactics, Zinoviev had said, “There can be only one answer: under no circumstances must there be a further split in the ranks of the German Communist Party. . . . Therefore the congress must press for an agreement.” On the surface at least such an agreement was reached. On July 9, three days before the theses on tactics were adopted, the congress passed a special “Resolution on the March Action and the Internal Situation in the V.K.P.D.,” which bore all the earmarks of compromise inasmuch as its tone was conciliatory toward the defenders of the uprising, although the congress had rejected their policy. The resolution, proposed by Zinoviev in the name of the Russian delegation, reemphasized that “The congress considers any further disintegration of forces within the VKPD, any factionalism—not to mention a split—as the greatest danger for the entire movement.” The congress, the resolution continued, expected that the Zentrale and the party majority would treat the former opposition with tolerance, and expected from the members of the opposition that they would loyally carry out the decisions reached at the Third Congress. The resolution concluded with a warning. “The congress demands of the former opposition … the immediate cessation of any political collaboration with persons expelled from the party and the Communist International. . . .
Before the congress voted on this resolution, Malzahn presented in the name of the former opposition an alternate version. Thalheimer immediately protested because Malzahn’s version, signed by Malzahn himself, Clara Zetkin, Paul Neumann, and Paul Franken, was too vague in form and content. Zinoviev supported Thalheimer and suggested that the former opposition offer their draft as a mere declaration rather than as a formal countermotion. The suggestion was accepted, and the Russian-sponsored resolution was unanimously adopted a few minutes later. Section seven, “The Lessons of the March Action,” was a document the tone of which was on the whole rather unenthusiastic. Perhaps its most important statement was the first sentence, with roundly asserted that “The March action was a struggle forced on the VKPD by the Government’s attack on the proletariat of Central Germany.” This statement became a Communist dogma from which no party publication has deviated since. There followed an enumeration of the mistakes committed by the party, with special emphasis on the fact that the mistake of not having clearly defined the “defensive” nature of the struggle “was aggravated by a number of party comrades who represented the offensive as the primary method of struggle. . .” Despite the errors, however, the congress was willing to grant that it considered the uprising “as a step forward.” The Russian leaders had been initially content with letting the matter stand at that, but in the process of formulating the final draft in committee had decided to elaborate on the meaning of this phrase. The uprising constituted one step forward because “it was a heroic struggle by hundreds of thousands of proletarians against the bourgeoisie,” and because the KPD, “by assuming leadership . . . showed that it was the party of the revolutionary German proletariat.” With these sparse compliments the German party had to rest satisfied. The balance of the section on the March action contained once again the look-before-you-leap sort of warning with regard to future revolutionary situations, although the congress stated explicitly that once the party had decided on action, everyone must obey and co-operate to the best of his ability. Criticism of an action was to be allowed only after the action was over, and then only within the framework of the party organization. The congress pointedly reminded all potential future critics that Levi had been expelled for having violated this basic principle of party discipline. The congress was over. Before the German delegation left for home to devote itself to its new tasks, the Russian leaders arranged for one more meeting with both German factions. The purpose of this get-together was to confirm the “treaty of peace” that had been concluded so laboriously and, as time was to show, so superficially between the majority delegation and its Right Opposition, Harmony seemed to have been established. Significantly, Reuter-Friesland who had held many private conversations with Lenin and other leading Bolsheviks, had been won over to the newest shift in policy as expressed in the slogan “To the Masses!” Thus the Russians had every reason to be pleased with the outcome of the Third Comintern Congress. This peace treaty marked a turning point in the development a German Communism. A distinct phase had come to a close. For when the conflict which divided the KPD after the March uprising was settled by the Russian-dominated Third World Congress, the German party unwittingly surrendered to Moscow a large share a its former independence which it was never to regain. Luxemburg’s maxim of friendly aloofness was buried for good, and its place was taken by Leninist centralization and discipline. The spirit of independence which Rosa Luxemburg had infused into the KPD had still been very pronounced during the first two Comintern congresses. The Zentrale had then felt free to weigh any advice the Bolsheviks gave, had argued with the Russian leaders from a position of strength and confidence, and in the end had made its own decisions. True, as an affiliate of the Comintern, the party had been bound by the over-all policy adopted at the first two congresses, especially by the twenty-one conditions of the Second Congress. But as long as Levi was chairman of the Zentrale, these policies had been interpreted liberally and with discretion. The Third Congress, where the intraparty feud over the March uprising became the key issue of debate, put an end to all this. The change came about for a number of reasons. In the summer of 1921 the Soviet Union, for the first time since the revolution, was in a position to exert more than a nominal influence over the Communist parties of Europe. Foreign and civil war, and Allied intervention, were past, making physical contact with the West easier, and at the same time giving Russia time to recover. Lenin was eager to utilize the relatively favorable situation to stabilize Bolshevik gains at home, and to strengthen the Communist movement abroad. As far as Lenin was concerned, the latter task could only be accomplished if the Russian Communist Party strengthened its control over the various European parties, something which he had always thought necessary and which now, for the first time, had become possible of realization. It was done at the Third Congress by tightening the bonds of organization and discipline within the Comintern. Special emphasis was placed on the authority of the ECCI over the member parties, thereby ensuring a better control over the Communist movement than had been possible in the past. The KPD, second in strength and importance only to the Russian party, facilitated the task of the Bolsheviks in no small measure. In their effort to change the general course of Communist strategy, Lenin and Trotsky in particular made the German question a key issue at the congress, incorporated the specific lessons learned from the March uprising into the theses and resolutions, and thus turned the German disaster into a Bolshevik asset. What was more, in the process of making the March action a convenient vehicle for implementing a major shift in policy, the Russians effectively destroyed most of the still remaining sparks of independence among the KPD leadership. Both factions of the German delegation had gone to Moscow in the hope of winning approbation for their respective stands on the uprising, and they were so deeply involved in their intraparty feud that they failed to see how much their disunity benefited the Russians. Without the coarse dictatorial manner which Stalin was to employ on similar occasions in later years, Trotsky, Radek, and Zinoviev displayed excellent teamwork in their handling of the German delegates. In private talks and on the floor of the congress, both factions were subjected to unsparing criticism but with the exception of Levi no one was punished for his or her past errors. After the Russians had censored the Right opposition for having abetted Levi, they turned around and used many of Levi’s and Zetkin’s arguments to chastise the Zentrale and its left-wing supporters. When it was all over, the German delegates could not help but agree that the Kremlin knew best. So strong was the prestige and personal magnetism of the Bolshevik leaders that the Germans submitted, however reluctantly in some cases, to the demands made of them. They let themselves be maneuvered into accepting theses and resolutions which, at least in part, were distasteful to them. Clara Zetkin was honored by the congress on her sixty-fifth birthday, and the Russians scored a minor triumph when Heckert delivered the principal ovation in the name of the German delegation, and showered the old lady with good wishes. Only four days earlier he had been one of her most outspoken critics. Finally, after Lenin had persuaded both Zetkin and Reuter-Friesland of the rightness of the Russian position, the way was clear to a general reconciliation, and in the interest of the common cause both Getman factions buried their differences, at least on the surface. Essentially, then, strong Russian influence over the affairs of the KPD dates from the Third Congress rather than from a later date. To be sure, it was initially neither as noticeable nor as rigid and oppressive as it was to become in Stalin’s time; yet it was there. Its foundation had been firmly laid by Lenin and his colleagues, firm enough for Stalin to build on and to make more effective. This is not to say that there was henceforth no more opposition to Russian interference in the German party. But what opposition there was never had a chance to restore the original spirit of independence, after Lenin had so successfully disposed of the Luxemburg tradition. In March 1922 Lenin wrote: “Paul Levi now wants to get into the good graces of the bourgeoisie . . . by publishing precisely those works of Rosa Luxemburg in which she was wrong. . . . Rosa Luxemburg was mistaken on the independence of Poland; she was mistaken in 1903 in her appraisal of Menshevism; she was mistaken in July 1914. . . She was mistaken in the works she wrote in prison in 1918, especially her book on the Russian Revolution. . . . But in spite of her mistakes she was and remains for us—an eagle.” Indeed, Lenin was by then quite safe in calling her that. He did not need to add that the wings of this eagle had been securely nailed to the wall, to serve as decoration for Communist meeting-halls and party offices—and that it was a very dead eagle.